A solo exhibition called ‘Umberto Centofante: A Life’s Work” was featured at the Arlington Center for the Arts (ACA) until last week and highlighted 40 years of still lifes, portraits and landscapes. “Centofante’s life began in Pontecorvo, Italy, where he grew up on his family’s farm. When he was eight years old, he says, his teacher gave him a sketchbook to take home with him. “The drawings earned him a prize and the opportunity to receive professional art instruction — a chance he had to pass up so he could help work the farm. Eventually, Centofante became a police officer and worked in Rome. After World War Two ended, he emigrated from Italy, bound for the Boston area and a job as a truck mechanic at Garwood Industries in Brighton he secured with help from an uncle who lived in Milton. Centofante had never been a mechanic, but he learned with the same intuition that had enabled him to fill the sketchbook. “Centofante says he never sketches out a project ahead of time — that he spends more time thinking and planning a painting than setting paint to canvas. Read more of the story at the Arlington Advocate. 13Forest is an art and craft gallery in Arlington that invites Opera on Tap singers to perform at openings. Our daughter-in-law sent us an e-mail about this today, and we went. It was charming. From Mark Adamo’s opera Little Women, the young performers sang Amy’s aria, Prof. Bhaer’s aria, and Beth’s, a gentle farewell. There was also a song based on a letter a soldier wrote to his wife before a battle in the Civil War. A short and sweet event. Made us wonder why more galleries don’t do this. 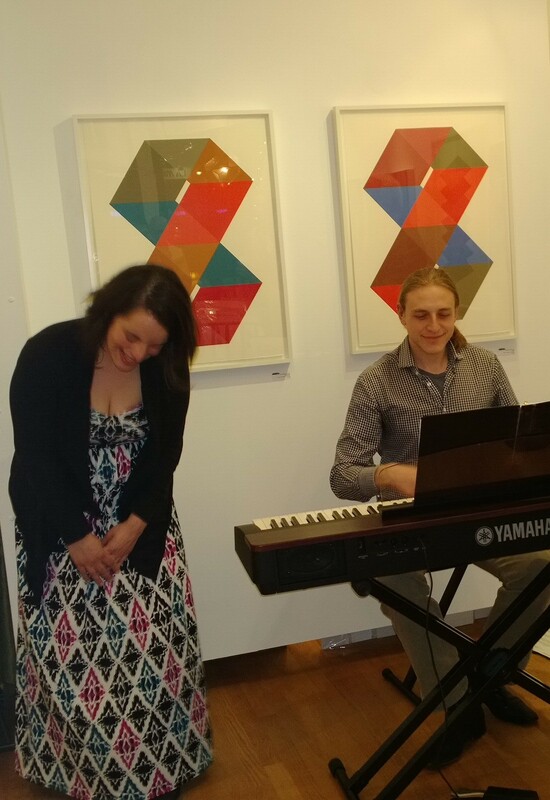 Opera on Tap taking a bow at 13Forest Art Gallery. Read about the national organization bringing opera to the people here. This was a weekend for looking at art. The quilts on the left are by Valerie Maser-Flanagan and are on display at the Concord Library. 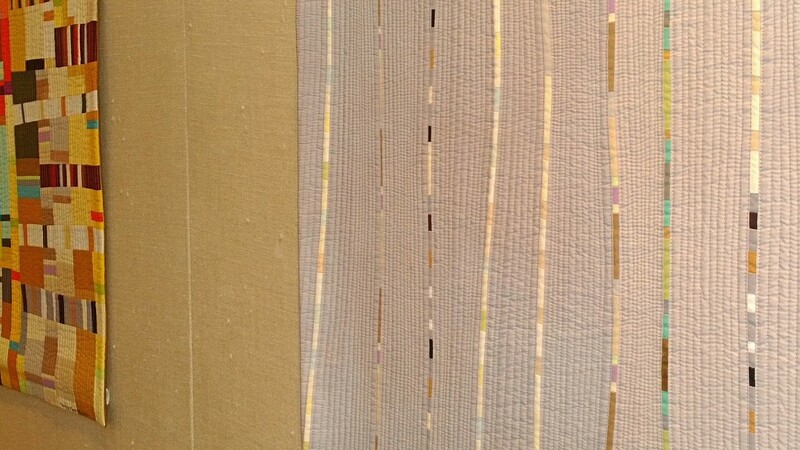 My favorite was the one with the vertical stripes. My husband and I also visited Brandeis University’s Rose Art Museum, back in action after being threatened with extinction by a president who lost his job over the ensuing uproar. I must say, the Rose presents some pretty inaccessible stuff, but the weird films by Mika Rottenberg were the highlight of the visit for me today. Mesmerizing. Sebastian Smee at the Boston Sunday Globe has more on Rottenberg’s videos, and he covers the other exhibits, too. Also this weekend, I stopped in at a gallery I like in Lincoln. They were featuring several interesting artists, including the photographer Leonard Freed, below. And they have other great work coming up March 4 — take a taste here. From “Black and White in America” exhibit at the Clark Gallery in Lincoln. See review by Mark Feeney in the Boston Globe, here. Lately, I have been following a very artistic art consultant on twitter called Liz Devlin. Here’s the part that floors me: “My 9-5 is in the corporate world as a Financial Analyst.” Gosh, how can she possibly have time for it all? A reason to follow her on twitter is that she keeps up on everything in the Boston arts scene for you. You can also check out weekly lists of events — with commentary — at her website. For example, here. I especially like the nostalgic, off-kilter look of this piece in the current Montserrat exhibit. L.S. 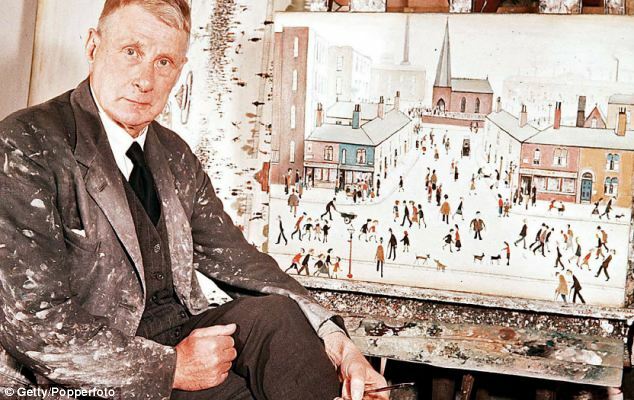 Lowry, (pictured in 1957), the artist from Manchester, is the subject of a major new show at the Tate Britain gallery. Some years ago when my husband was in England on business, he acquired a print of workers coming and going outside a factory. The original was by L.S. Lowry, whose paintings of industrial Britain turn out to be very popular in the UK. Popularity, however, is not a ticket to being shown at the Tate Britain. Belatedly, Lowry will receive a retrospective in 2014. Oliver Wainwright at the Daily Mail writes, “Clouds of smoke belch from forests of chimneys, while armies of spidery figures scuttle to and fro between narrow terrace houses and imposing factory gates. “Crowds of fans shiver on the edge of a football field, a fist-fight breaks out, and barefoot children tease a stray cat on the street corner. “These are the scenes depicted in the haunting paintings of L.S. Lowry who, more than any other artist, managed to capture the strange, bleak beauty of daily life in northern industrial towns. “His dream-like images captured the popular imagination, adorning chocolate boxes and biscuit tins, tea towels and jigsaws. “Why has it taken so long? If you’re an artist, be careful to stay off “chocolate boxes and biscuit tins, tea towels and jigsaws” — or wait to be discovered by art experts of a future generation.